Pentecost Sunday, May 20, 2018, was an exciting day at Trinity Lutheran Church in Mobile, AL. 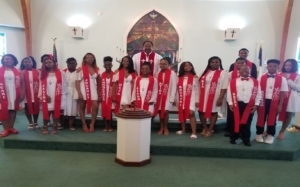 Seventeen young people were confirmed and became the newest confirmed members of the congregation. They completed two years of instruction under the direction of Rev. Dr. Ulmer Marshall. After the service, a reception was held in the Marshall Fellowship Hall, in their honor to celebrate their accomplishments. They, along with their parents, have committed to continue their Christian education by attending Sunday school each Sunday. Emelda Remond Retires Who’s the Biggest Egg Head?